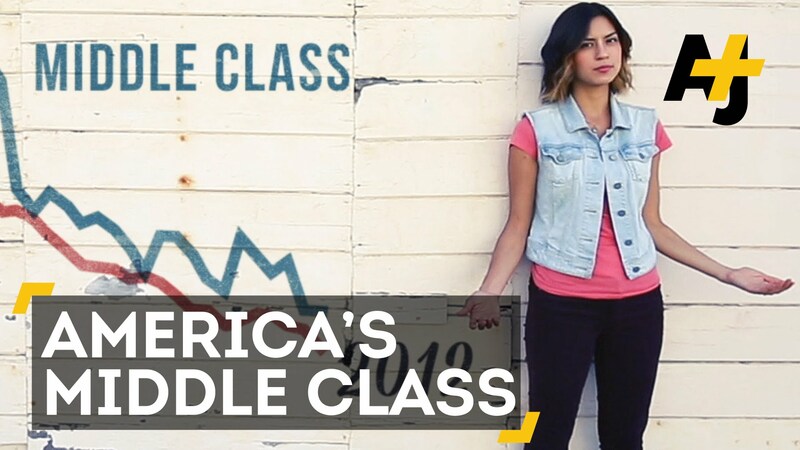 We’ve all heard it before: the American middle class is dying. The numbers appear to support the narrative at face value, but as Mark Twain famously reminded us, there are three kinds of lies: lies, damned lies, and statistics. It is true: those earning income that we would define as “middle class” have been on the decline, but that doesn’t mean they’re getting poorer. They can move up the income ladder, or fall down it. Let’s take a look at two charts from the American Enterprise Institute’s Mark Perry to get a better picture. The only difference between the two is how they define what qualifies as a middle class income, but both tell the same story: the middle class is shrinking because we’re all getting richer, not poorer. 1. The top chart shows the three income groups: a) low-income households with income of $35,000 and below (in 2014 dollars), whose share of US households declined from by five percentage points from 38.7% in 1967 to 33.7% (in 2014 dollars), b) middle-income households with income between $35,000 and $100,000 (in 2014 dollars), whose share of all households declined by 11.6 percentage points from 53.2% to 41.6% between 1967 and 2014, and c) high-income households with income of $100,000 and above (in 2014 dollars) whose share increased by a factor of more than three times (and by 16.6 percentage points), from 8.1% in 1967 to 24.7% in 2014. 2. The bottom chart shows the three income groups: a) low-income households with income of $50,000 and below (in 2014 dollars), whose share of US households declined from by 11.4 percentage points from 58.2% in 1967 to 46.8% in 2014, b) middle-income households with income between $50,000 and $100,000 (in 2014 dollars), whose share of all households declined by 5.2 percentage points from 33.7% to 28.5% between 1967 and 2014, and c) high-income households with income of $100,000 and above (in 2014 dollars) whose share increased by a factor of more than three times (and by 16.6 percentage points), from 8.1% in 1967 to 24.7% in 2014 (same as before for this income category). As you can glean from both charts (and Perry’s analysis), the percentage of people earning “low” and “middle” levels of income decreased – while a proportionate share of Americans saw themselves move into the high income category. What’s happening is that our liberal friends are defining what kind of income qualifies one as “middle class” on a fixed basis. As society becomes wealthier, people move beyond that hurdle, and it appears that the middle class is shrinking even as we’re becoming richer. Next Is the Job Market Sexist?